Full Size Bariatric Alternating Air Mattress 42"
Full Size Bariatric Mattress 42"
This 42" Full Sizebariatric mattress provides alternating pressure to optimize pressure redistribution for patients with up to Stage IV pressure ulcers. It is ideal for use in the home, long term care, or acute care setting. 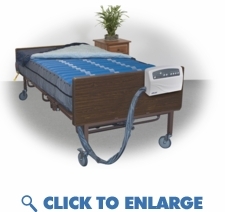 Get a Full Size Bariatric Mattress 42" on MedicalAirMattress.com Now! We offer fast free shipping on all our medical air mattresses and products! Cell-on-cell design of 10" deep air cells prevents "bottoming out" and also provides up to 24 hours of power outage protection. Digital pump allows for customization to individual patients' comfort and safety needs, and will auto-return to alternating pressure mode if system is left on static mode for >2 hours. 4-way stretch cover is low sheer, fluid resistant, vapor permeable, quilted and zippered. Each one of the 20, 10" deep air bladders are easily removed and replaced. Maximum Support Capacity: 650 lbs.